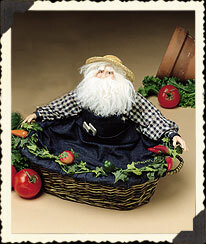 Display your prize fruit and veggies in this J & T Designs basket, which is fully lined and features resin Santa gardener, Nickleby. 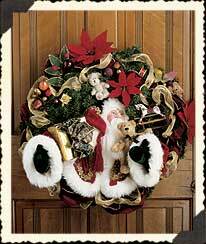 Deck the front door for the holiday season with this oversized pine wreath, which features a cheery holiday figure robed in a velvet cloak with gold braid and plush fur trim and velvet mittens. He holds special Christmas presents and is surrounded by colorful and decorative accents-glass-bead fruits, chenille and gold voile ribbon, miniature teddy bears, miniature nutcracker figures, and velvet poinsettia flowers.